West Valley City • For a few seconds before a police officer shot a man in a garage of a West Valley City house last week, the man had his left hand raised in the air. Then he abruptly pulled his right hand out of his pocket and a West Valley City police officer fired, three times. One bullet struck Elijah James Smith. Body camera footage, released by West Valley City on Tuesday afternoon, show the tense seconds before Smith was fatally shot just after 3:30 p.m. on April 8. Police later found a screwdriver on the ground next to Smith, a 20-year-old black man. Investigators believe it had been in his pocket. Three children — ages 9, 10 and 13 — were inside the house at the time of the shooting. Smith had come to the house while running from police, who were searching the area for someone suspected of stealing from a cell phone store near 3400 South on Redwood Road. Smith matched the suspected thief’s description of being a black male, wearing a gray hoodie and black pants, police said. An officer saw Smith hop over a fence into the backyard of a house in a cul-de-sac, according to police. The homeowner reportedly told Smith to leave, and he did. Officers found two cell phones at that house. Investigators haven’t determined whether the cell phones came from the robbed store. But, “to my knowledge, they have video from the store, and it was Mr. Smith who was in the store,” police Chief Colleen Jacobs said Tuesday at a news conference. A police officer then saw Smith go into another house. The released body camera footage shows three police officers arrive at the West Valley City house, located near 3550 South and 2100 West. A 13-year-old boy answered the door. “There’s some, some guy here,” the 13-year-old is heard telling police. The officers walked through the house, and opened the door into the garage, where Smith is standing next to a car. “Put your hands up now. Let me see your hands,” the officers shout repeatedly, from a staircase leading down into the garage. The officers told Smith to show his hands 15 times in 24 seconds, Jacobs said on Tuesday. Video shows Smith move from one part of the garage to where he was behind a car. Smith then put up his left hand. “Get your hand out of your pocket,” officers shout. One of the officers was inching around the car, toward Smith, who raised his right elbow while pulling his hand out of his pocket. One of the three fired bullets hit Smith, killing him. Simultaneously, another officer deployed a stun gun, which didn’t reach Smith. Afterward, next to Smith on the floor, police found a “modified” screwdriver, said Jacobs, who declined to detail how the screwdriver was modified. She said investigators believe the screwdriver had been in Smith’s pocket. The 13-year-old boy later told police that Smith had knocked on the door. Then, when the teen answered, Smith “barged in” the front door “aggressively,” according to police. Smith reportedly said something about getting a drink of water, Jacobs said. Protestors and friends have said they believe Smith ran and hid because he was scared. “Once again, it’s clear that police will see whatever they want to see in order to justify violence against people of color,” Dave Newlin, of Utahns Against Police Brutality, wrote in an email on Tuesday. “I see a terrified young man with his hand in the air, desperately and clearly trying to put up his other hand exactly as police have demanded. I see someone who is trapped after running for his life, who knows that at any moment, the violent racism of Utah’s police could take his life, as indeed it does,” Newlin continued. The officer who fired the shots is on administrative leave, pending the conclusion of the investigation. The other two officers are on full duty, according to Jacobs. The officers perceived Smith raising his right arm rapidly as a threat, she said. As to what officers could have done differently, Jacobs didn’t really have an answer. The patrol officer who fired his weapon has been with West Valley City for just under two years, according to police, who have not released his name. Activists have said the police officer’s use of force was excessive. On Saturday, they called for the release of the body camera footage and the firing of the officer who shot Smith. Friends and family members have raised $5,700 for his funeral costs through an online campaign. Smith and his cousin, Monte Brown, often talked about their fear of police because they were young black men, Brown said at Saturday’s protest. The last text message Selena Montoya received from Smith, her childhood friend, asked about how to apply to college, she said at a protest. 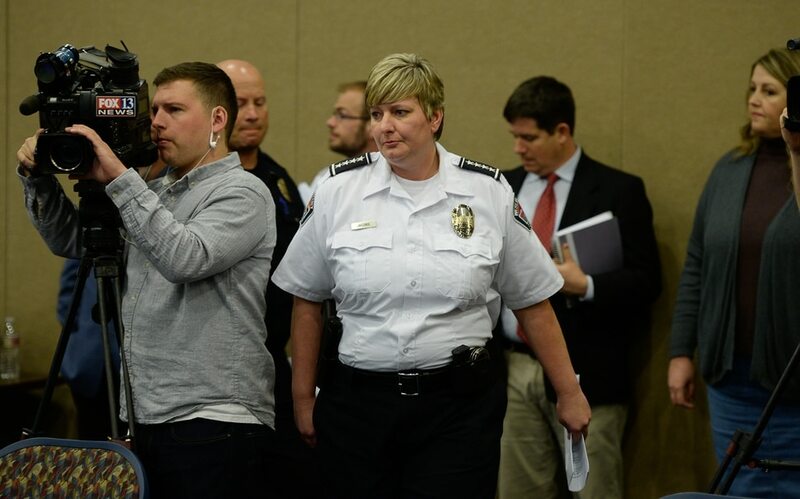 (Francisco Kjolseth | The Salt Lake Tribune) West Valley Police Chief Colleen Jacobs arrives for a press conference at City Hall on Tuesday, Apr. 17, 2018, to release body cam footage of the fatal shooting of 20-year-old Elijah James Smith. On April 8, Smith was shot and killed by West Valley police officers who believed he matched the description of someone involved in a theft at a cellphone store and was later cornered inside a homeowners garage where he put his hand into his pocket despite repeated calls to show his hands. (Francisco Kjolseth | The Salt Lake Tribune) West Valley Police Chief Colleen Jacobs holds a press conference on Tuesday, Apr. 17, 2018, to release body cam footage of the fatal shooting of 20-year-old Elijah James Smith. On April 8, Smith was shot and killed by West Valley police officers who believed he matched the description of someone involved in a theft at a cellphone store. (Francisco Kjolseth | The Salt Lake Tribune) West Valley Police Chief Colleen Jacobs, center left, holds a press conference on Tuesday, Apr. 17, 2018, to release body cam footage of the fatal shooting of 20-year-old Elijah James Smith. On April 8, Smith was shot and killed by West Valley police officers who believed he matched the description of someone involved in a theft at a cellphone store. (Francisco Kjolseth | The Salt Lake Tribune) West Valley Police Chief Colleen Jacobs holds a press conference on Tuesday, Apr. 17, 2018, to release body cam footage of the fatal shooting of 20-year-old Elijah James Smith. 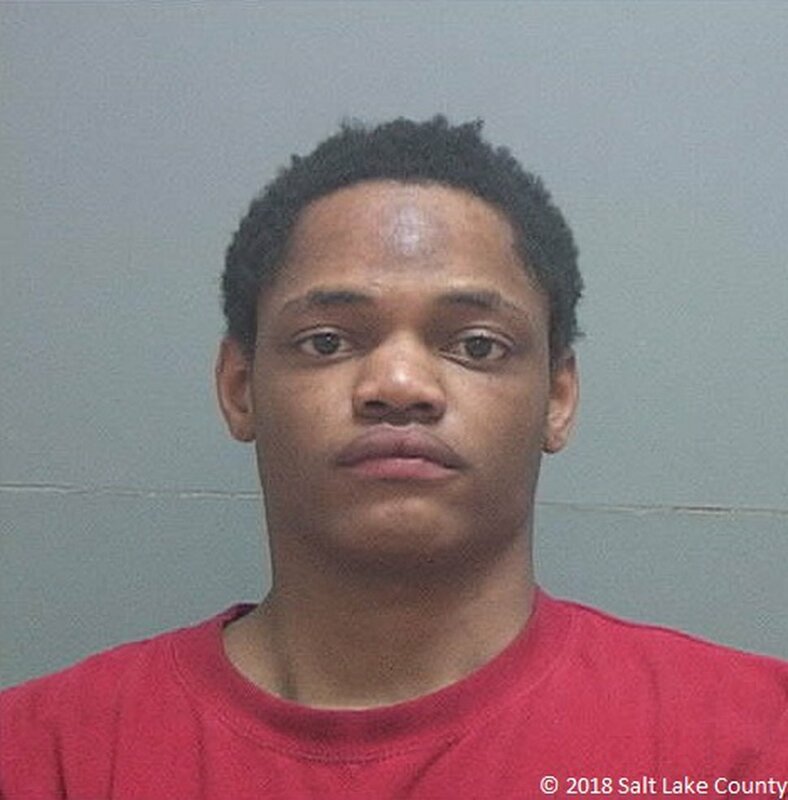 On April 8, Smith was shot and killed by West Valley police officers who believed he matched the description of someone involved in a theft at a cellphone store. 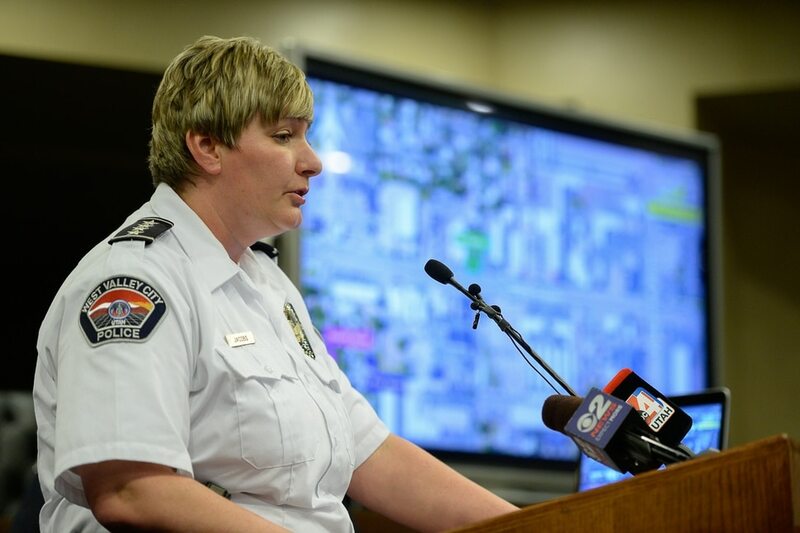 (Francisco Kjolseth | The Salt Lake Tribune) West Valley Police Chief Colleen Jacobs is joined by Lt. Kent Stokes as they hold a press conference on Tuesday, Apr. 17, 2018, to release body cam footage of the fatal shooting of 20-year-old Elijah James Smith. On April 8, Smith was shot and killed by West Valley police officers who believed he matched the description of someone involved in a theft at a cellphone store. (Francisco Kjolseth | The Salt Lake Tribune) West Valley Police Chief Colleen Jacobs holds a press conference on Tuesday, Apr. 17, 2018, to release body cam footage of the fatal shooting of 20-year-old Elijah James Smith. On April 8, Smith was shot and killed by West Valley police officers who believed he matched the description of someone officers were looking for after a theft at a cellphone store. 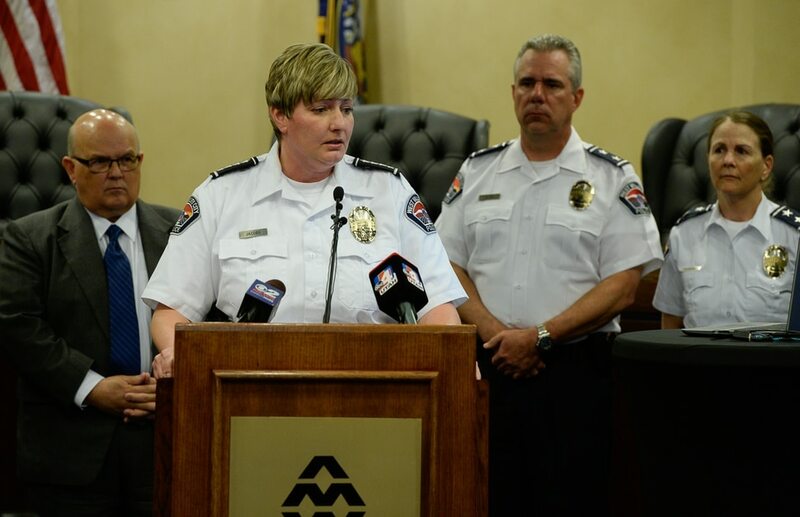 (Francisco Kjolseth | The Salt Lake Tribune) West Valley Police Chief Colleen Jacobs, center right, holds a press conference on Tuesday, Apr. 17, 2018, to release body cam footage of the fatal shooting of 20-year-old Elijah James Smith. On April 8, Smith was shot and killed by West Valley police officers who believed he matched the description of someone officers were looking for after a theft at a cellphone store.